into ice cream maker. While mixing in the ice cream maker, make the chocolate pieces. Gently melt coconut oil over low heat, stir in cacao and maple syrup. Pour onto a piece of wax/parchment paper on a flat plate or baking dish. Freeze sheet of chocolate for 15 minutes, then break into small pieces. 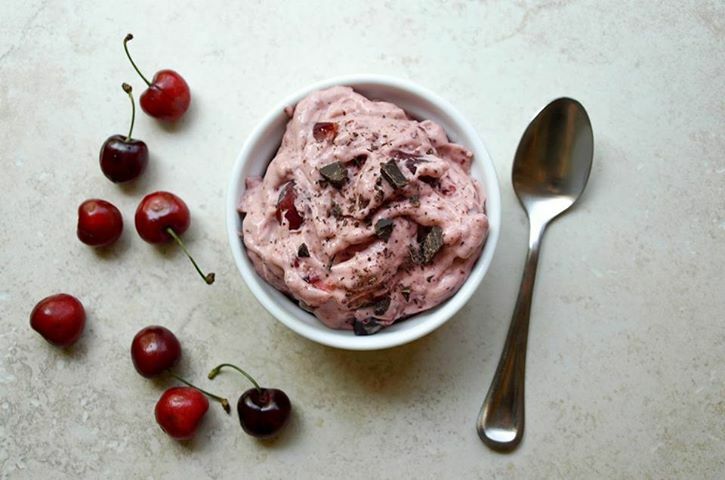 When ice cream is starting to firm up, add in frozen chopped cherries. Remove from ice cream maker when ready, and stir in chocolate pieces. This recipe is also delicious without the chocolate. Yum! I’ll have to try this recipe!